Vegetable lo mein, which typically consists of spaghetti-type noodles and vegetables with a soy-based sauce, can fit into a healthy diet if you watch your portion size. The vegetable version is lower in calories than the house version, which can have as many as 1,100 calories per order. However, even vegetarian lo mein can have almost 900 calories per order. The calories in a pint, or 2 cups, of vegetable lo mein will vary based on the recipe. A typical Chinese restaurant version of this dish contains between 330 and 390 calories in each pint. 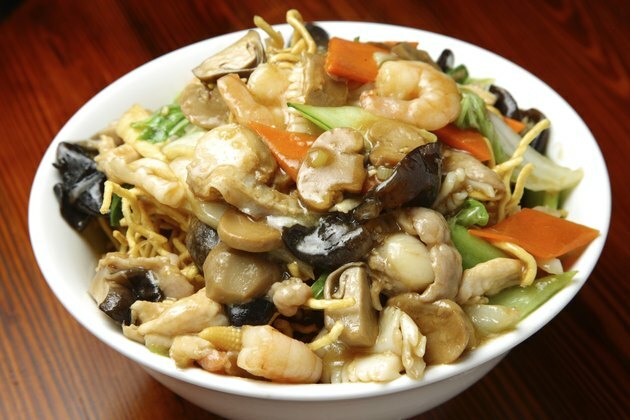 Ask the chef to use broth instead of oil when preparing your lo mein. This is called a "vegetable stock velveted" preparation and reduces the number of calories in the dish. You can also make your own lo mein, using a greater proportion of vegetables to noodles, whole-wheat noodles instead of regular noodles, low-sodium soy sauce and chicken broth to create a healthy, lower-calorie version at home.